James Balchin was born in Cranleigh in early 1874. In 1881 he was living in Horsham with his parents, six brothers and one sister, and in 1891 he was in Ockley. 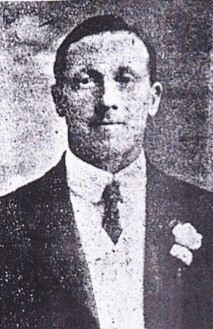 He married Rosetta Meacock in 1906 in Southwark and in 1911 they were living in Peckham with two young children and one of his younger brothers. James was a “Journeyman Farrier”. His parents were living at 1 Holm Terrace, Flint Hill, North Holmwood. James moved to South Africa in August 1913. He served in the army (Number 4754), becoming a Sergeant Major in 7th Battalion, South African Light Horse. (South Africa did not have conscription.) This battalion was engaged in fighting German units in German East Africa (later Tanganyika, now part of Tanzania). He died on 11th March 1917 at the age of 42 and is buried at Thaba Tshwane (Old No 1) Military Cemetery, near an important military base outside Pretoria, South Africa. His widow Rosetta was living in Tamboers Kloof, near Cape Town.